I was at the Fredericton market this morning, getting half our groceries (meat, fresh veggies) when I stopped at Betty Lee’s Chinese food stall. I picked up some shrimp chips and pot stickers. Betty is awesome and her food is delicious. I said something about loving food a bit too much and patted my belly. She said to me that the Chinese have a saying about how food is meant to be savoured and enjoyed. “My mom has a saying too,” I told her. I’m sitting here in my front porch sunroom with my laptop table and the door open. Stupid blackflies… it’s yard sale season, the weather is gorgeous and it’s a long weekend here in Canada. This time for our yard sale we took a good hard look at some of the furniture peices we had and put a whole pile out in the yard. A good amount is gone but I’d still like to see some of the smaller items go. There’s also the toys and books we cleaned out (tho Meaghan is still cleaning out toyd) and the boxes of both Meaghan and Sarah’s stuff they had here and there. And extra dishes. And random stuff. And things from boxes you finally went through that went unpacked from the last move. I cleaned out a lot of my book when I realized we had so many we’d have to buy a new bookcase, plus there were so many we mostly just looked up stuff online because we couldn’t remember if we had a book on the subject or not. Also? Turns out when you’re done to one last kid, all the extra homeschooling stuff (or anything loosely related to anything educational by any extension) that I have kept “just in case” get crystal clear when you’re down to one kid with specific interests. It’s also become crystal clear than when we *do* take up an interest, as a family, we tend to go overboard and buy a whole pile of resources anyway. This may or may not be related to the difficulties in finding what we have on hand… Hmm. Ron is being house husband too, since we got up at 6:30am. While I’ve been dealing with the occasional shopper, he’s been tidying up and even made scones for us. They were pretty yummy and he only had to ask a couple questions about how I follow (or not follow) the actual recipe. OMG the funniest thing happened. I had the big huge wicker chair for sale – a homemade one from .. twigs, basically. I just sold it to a lady, who called her husband to see if he could come get it with his truck. Not five minutes later, a guy pulls up in a truck, hops out and heads straight for it. So of course, I assumed it was this lady’s husband. He siad his wife saw the chair and asked him to come back and get it. Kinda felt bad for the other guy though. Ron thought it wouldn’t sell and here I could have sold it twice. Went to Austin, met awesome co-workers, some of whom I had met before. Actually, now that I remember again – our flight to Dallas couldn’t land due to thunderstorms, so we diverted to Shreveport LA for fuel. Turns out since we were all connected us passengers found out the Dallas airport was closing and even if we could get there out flight from Dallas to Austin was cancelled. So we got off the plane in Shreveport, rented a car and rove for 6 hours to Austin. At least we got to see East Texas. Y’all got no hills in Hill Country. I will show you hills. We met our friends Abbie & Shane, who are awesome. They took us to the LEGO store AND the Apple store, and I was like a kid in a .. well, yeah. It was fun. I should probably write a whole post on that, but this is enough to jog my memory later. I got groceries today too, so it’s not all work. Grabbed some containers to organize my fabric, and a couple for the toys Meaghan has been sorting in the front porch. which was a total and complete mess and emma never used any of it any more. (partly given it was too hard to find anything). Spring always makes me want to organize all the things. Oh! And! I;ve been taking allergy meds. I finally found some that don’t make me narcoleptic or head spacey. There was one kind I tired, I wound up doing things like turning the stove on high and walking away for ten minutes. Not good. This kind (Claritin) doesn’t make me spacey, but I just go and go and then … drop. But I am not sneezing and itching, especially with all the dusty cleaning and sorting we’re doing. We tried to have a yard sale last weekend, but it rained. So we’re shooting for setup this Thursday or Friday. Around here yard sales start Friday afternoons. Between my hands hurting from the rain, and Rons sciatica bothering him, we’re turning into old folks. Right now, I am skipping over the whole “haven’t posted in HOW long” part and just diving in. Sarah came up for the weekend – actually, we picked her up on Tuesday when we went to Fredericton for an orthodontic consultation for Emma. Guess who is getting braces? 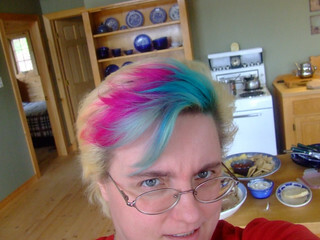 And then, since the dye was there and all, she added a pink streak to my hair. I also touched up some of the blue for more contrast and left some of the faded, previously blue now mermaid green section. This way, it’s a warning for the people who think I am some mild mannered mom, that maybe – just maybe, I am a bit crazy. So – to the adventure time. For Mother’s Day Ron made us all yummy pancakes for breakfast because he is awesome at it. We had them for breakfast because we were going to my mom’s for potluck lunch with us, Addison & Kaytlyn and Izzy and Kaytlyn’s mom Lynn and her husband Patrick. We all piled in the car, with half the food, and added all of Sarah’s stuff because we were dropping her back to Fredericton when we were done. Our place is 1 hour and 15mins from Fredericton. My mom’s place is another hour the other side of that. So lots of driving was done. We were just on the other side of Fredericton, passing into Oromocto, noting how the water still had receded much by the marshy spot near the highway… oh… car broke down… they look familiar.. OMG it’s Addison! We turned off at the next exit (RIGHT THERE) and then had to go 2 or 3 kms back down the highway so we could turn around and come up behind them again. Izzy was especially happy to see us. Kaytlyn more so, as they had someone who had stopped to get them some quick fix but by now, she had terrible heartburn and Izzy was almost out of milk. So Ron took off to the store to get some further needs (addison had lots of water since he had walked to the nearest gas station already) and I stayed to amuse the grandbaby. Izzy of course was thrilled we were there. “NANNy! WHERE GRAMPY?” and then after she had Grammie on one side and Nanny on the other, both exclaiming she was the prettiest smartest ever, so of course she was all smilies. Eventually we got everyone sorted, made sure they could hobble back home and went on our way. Oh darn. 🙁 So when we finally got to my mom’s (almost an hour late) the email Sarah sent from her phone hadn’t been seen. We had to fill her in, so we were disappointed. Mom says next family dinner we’ll all just meet in Fredericton, stupid car. 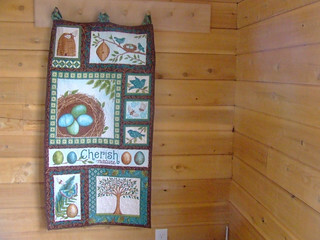 We did eat half the food though, and I gave my mom the panel she wanted me to quilt for her. I’ve been DYING to talk about it, since I did different quilting everywhere on it and couldn’t post. Side note: when I have too many things on my mind I can’t post about, it doesn’t leave much left I *can* post about, you know? After we were done at mom’s about mid afternoon, we packed up most of the food (including the lamb roast) and headed back to Fredericton to stop in to Addison’s place. They had made it fine back home, and then dropped off Kaytlyn and the baby, but broke down again almost to the mechanics. And at an intersection. At any rate, when we got there, Addison was back, and the girls were napping. 😀 So he had to entertain us all by himself while we were all just plain tired. Eventually Izzy got up, we heated more leftovers including the lasagna casserole they were supposed to bring to my mom’s, and I stuffed his fridge with more food I didn’t want but that they will happily eat till mid-week. Then it was time to go and Izzy refused to hand out hugs. If you don’t hug people goodbye, they don’t leave, right? Oh, I just realized I didn’t gush about my mother’s day presents. 🙂 A & K got me a hanging basket of pansies, my favorite flower, as well as a framed picture of my kissing Izzy to pieces. Sarah got me a HUGE squirt bottle of Satsuma body wash from the Body Shop. It smells like orange pop. Meaghan made me red velvet cake with this super rich flour icing. “It’s a vehicle for getting butter into your mouth”. Emma did nice things for me, which is mostly what I look for, a mom’s day off. I don’t mind reheatng, but I don’t want to cook on Mother’s day. 😀 That, and see all my kids. That’s all I need. The super long drives I can do without. UGH. Here’s hoping i can keep updating. I’m still trying to figure out when is a good time for me.